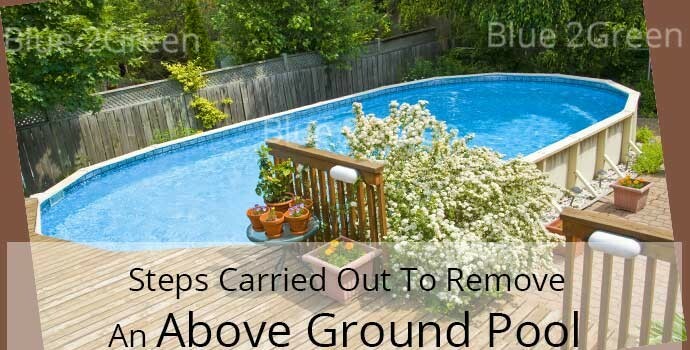 If you are one of those people who stare at their above ground swimming pools and then, see how much money you have to shell out to get rid of it, then the best option for you is to hire a pool removal company and get the job done in the best way and within your budget. An important thing that most homeowners fail to understand is that, the removal process takes a lot more than breaking apart the swimming pool and hauling it away. They think, breaking down the swimming pool is the only step, but when they see 3-5 tonnes of sand accumulated on the site, then they realize that they have made a big mistake by breaking down the swimming pool. So, to get avoid getting into such immense hassles, the only option left is, hire the professionals who have both, the expertise and the experience to handle this kind of a project in the most appropriate manner. A professional pool removal company has the manpower to handle above ground swimming pool removal. The tasks of hauling away and removing gigantic pieces will be carried out in a smooth manner. The company is going to be respectful to the lawns and they will try their best that the surround area of the swimming pool remains undamaged. It will require some specific tools and steps to remove the swimming pool. But, more than the tools, it is the steps performed prior, during and after the removal that will decide whether the job was successful or not. The first step would be to disconnect all the necessary electrical connections. There could be important wires lying under the ground, which can get damaged. Moreover, there is a chance that the workers could get electrocuted. With the help of a submersible pump, all the water from the swimming pool will be drained out. The removal process can’t be done without draining all the water out of the pool. Then, all the pool hoses and pumps will be disconnected. Drain the swimming pool filter and remove the sand particles that are present in the swimming pool. After that, swimming pool liner will be cut into small sections, which can be easily managed. In the next step, the wall posts surrounding in all corners around the swimming pool need to be disassembled. Lastly, remove and recycle all the old panels. The swimming pool removal process varies from customer to customer, but if the services of a professional company is taken, then there is nothing to worry. Yes, the complications are there, but with the help of proper tools and equipment, the job can become less tedious. Some people try to do the task on their own and they fail miserably. There is no need to DIY in order to save a few dollars because the charges taken by the pool removal company are also quite less, plus they go for the perfection at work. You can easily find a decent pool removal company in your area and hire them for removing your above-ground swimming pool, which you hardly use. If you are way too conscious about the charges, then you can ask for a quote first. Most companies offer no obligation quote to the customers, so there isn’t any problem there. So, get rid of your above ground swimming pool today!